Nothing is coming up roses for Kaylee Bleu. Not only are all of the plants in her flower shop going thirsty because of a busted well pump, but a competing florist of Orcas Island is stealing customers from The Flower Patch. As if that wasn’t enough to turn her into Florist Grump, a new client who could be Kaylee’s golden ticket to the lucrative country club set is also her most persnickety yet–and continuously threatens to take her business elsewhere. But all of that seems like no big deal when Kaylee’s plumber discovers a fractured skull in her shop’s yard. The remains belong to Danny Lane, a troubled teenager accused of killing a high school girl in a boating accident thirty-five years ago. The consensus around Turtle Cove was that the boy fled town shortly after the accident, but Kaylee thinks the holes in that story are as big as the grave-size pit dug up around her well pump. Unfortunately, somebody on Orcas Island wants Kaylee to leave the past buried. At first, she refuses to be intimidated by menacing messages and frightful pranks. 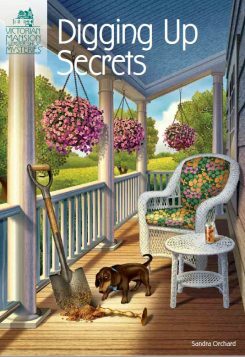 But when suspicious accidents begin to befall witnesses close to the cold case, Kaylee’s seeds of doubt blossom into dread. She must decide how deep she’s willing to dig to determine if Danny’s death was an accident . . . or murder.